Holly Simonsen works in ecopoetic collaboration with her native landscape, Great Salt Lake. She operates under the thesis that ecologically disrupted sites offer access points for the body to experience language as a product of the earth. She works on the page and off, incorporating installation art, performance art, sound experimentation, and ephemeral sculpture into her poetic practice. 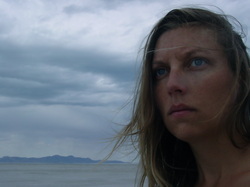 In 2010 she circumnavigated the southern portion of The Great Salt Lake, a journey of over a hundred miles, as poetic ritual. She recently served fellowships at the Vermont Studio Center and the Djerassi Resident Artists Program. She invites you to read more about her poetic process in this interview for Labletter.